The TOEFL PBT is a secure Paper based test recognised and accepted by many academic institutions (as well as NZQA and for Australian Student Visas from some countries). It is bundled with the TWE (Test of Written English) - so it tests Listening, Reading, Structure & Written Expression, plus Writing. This test is still in active development, but is only offered where TOEFL iBT is not available. The TOEFL PBT can be taken in Fiji. The official paper based test can not be taken in Australia or New Zealand. 1.TOEFL iBT is the direct replacement official test. Differences: online, more advanced, tests all 4 facets (Listening, Reading, Speaking & Writing). Ideal for: University high stakes testing, for entry to degree and graduate programs, and visas. Differences: focus on general and Workplace English. Listening and Reading is paper based, while Speaking and Writing is Internet based. Ideal for workplace communication, and entry to lower level more practical courses that need general English proficiency rather than academic. 3.TOEFL ITP institutional TOEFL PBT. Differences: Same test, different conditions. - Random test form (10 new forms a year, not a new form every session). - Administered directly by schools not by independent examination centres. -a recognisable scoring metric (ie TOEFL PBT scores) in non-Official form. -a high end alternative to school-created tests (but without a writing test). TWE option? 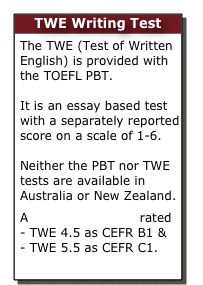 The TWE provides a separate “opinion essay” writing score, so to be equivalent a school needs use the TOEFL ITP with an essay assessment equivalent of their own. Some schools use the TOEIC Writing exam which includes an “opinion essay” scored to the same rubric/standards (learn more), with a new cut-off score. Note: The TOEFL iBT is a superior test. The TOEFL ITP (Institutional) can not replace it.